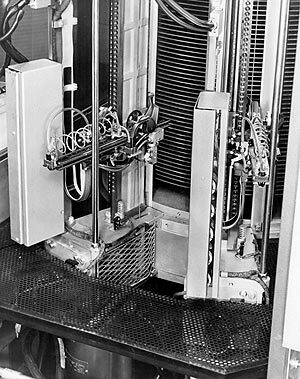 Today in 1956, IBM introduced the disk drive. came with fifty 24-inch disks and a total capacity of 5 megabytes; its first customer was United Airlines’ reservations system. Incorporated into the 305 RAMAC(Random Access Memory Accounting Machine, announced ten days later), it promised, as the IBM press release said, “that business transactions will be completely processed right after they occur. There will be no delays while data is grouped for batch processing. People running a business will be able to get the fresh facts they need, at once. 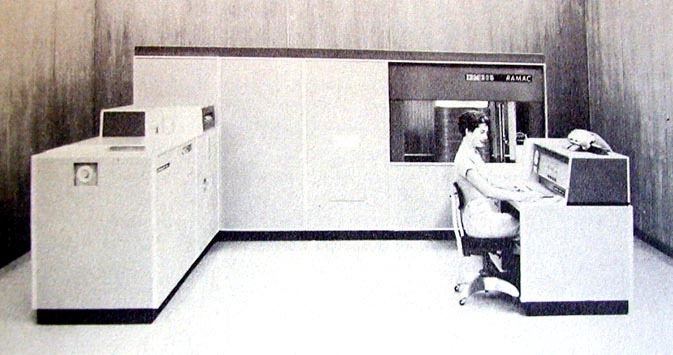 Random access memory equipment will not only revolutionize punched card accounting but also magnetic tape accounting.” Later, it was exhibited in the 1958 Brussels World’s Fair, where visitors could query “Professor RAMAC” using a keyboard and get answers in any of ten languages. This public relations coup heralded a day when millions of people would access and retrieve information from the largest tub file ever assembled – the World Wide Web. The RAMAC became obsolete within a few years of its introduction as the vacuum tubes powering it were replaced by transistors. But disk drives, invented more than 55 years ago in a search for faster access to information, are still used as the containers for almost all digital information today. Today, you can buy from Seagate a 3TBs disk drive, the size and weight of a small book, for $199.99 (the entire 305 RAMAC system leased for $3,200 per month or $25,784.96 in 2010 dollars). The market for disk drives in 2011 is projected to reach $28.1 billion, according to iSuppli. And tomorrow? Steve Lohr in the New York Times: “Flash [memory] stores data in the cells of semiconductor chips instead of on spinning magnetic disks. The data-storing density of hard disks has improved at an extraordinary pace… But the performance bottleneck has been the scant improvement in the speed of finding and transferring the data from the spinning disks — the mechanical side of hard-disk storage. As companies grapple with a flood of new data — from the Web, social networks, sensors and video — the constraint of traditional storage only becomes greater. That, analysts say, is a crucial reason flash will sooner or later become a mainstream technology in data centers.